Even though it’s technically May, I still needed one more rye cocktail to round out April. And since my other concoctions have turned out so well, I thought I’d step out on a limb and try out something that’s been in the works for a few weeks: a witch’s broom puerh tincture. Kinda looks like swamp water, huh? 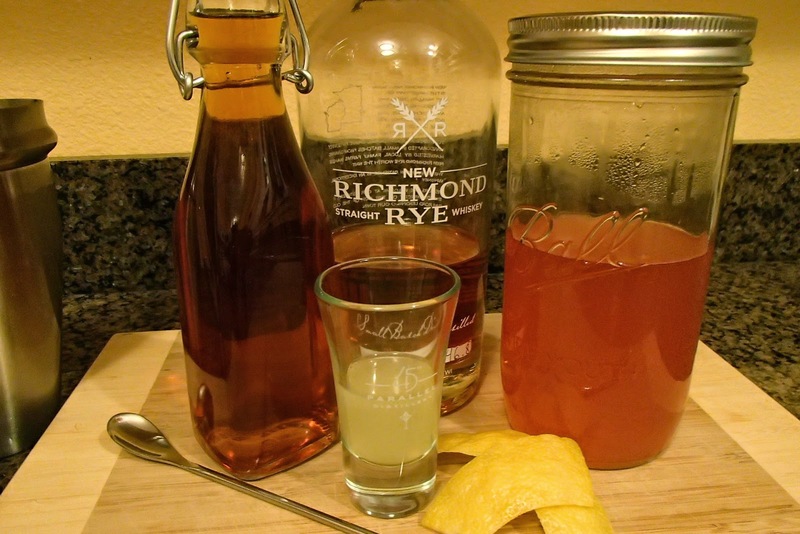 This infusion is my first foray into the realm of homemade bitters. 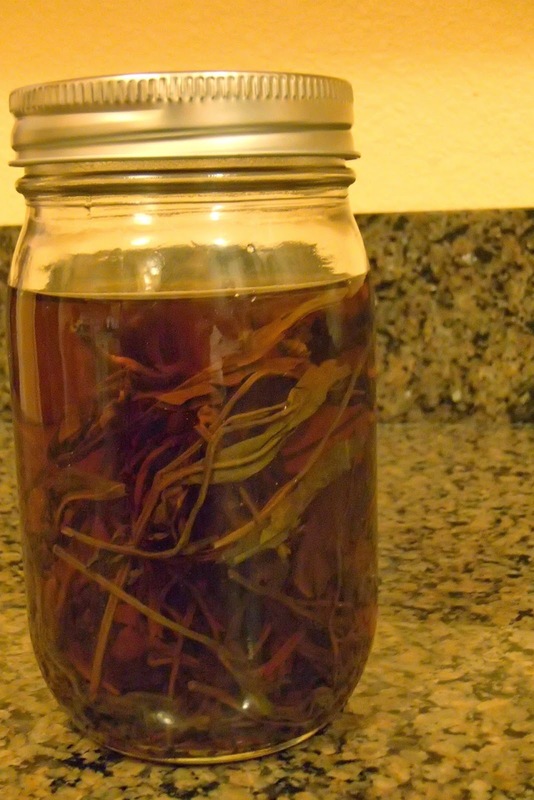 The tea was picked out by my wife and was allowed to infuse in vodka for about two weeks. Now, if you wanted this to taste like a properly-brewed cup of tea, you wouldn’t infuse the tea for the entire two weeks; in fact, two or three days may be enough for that flavor profile. But that’s not was I was looking for here. This herbal, bitter, warm liquid tastes like overbrewed tea, in the best way possible. While it’s not necessarily potable on it’s own, a dash or two added to a drink adds a slew of flavors and tea’s characteristic aroma. While this tincture may eventually become the base for a complex homemade bitter, I wanted to try it on its own first, to see how it held up against some some stronger flavors. This drink may take a little bit of extra preparation, but it’s well worth it. I present to you: the Savannah Trading Co. Unfortunately my wife and photographer was indisposed, so these pictures are decidedly worse than usual. Sorry! First, the peach simple syrup. It’s actually quite simple. 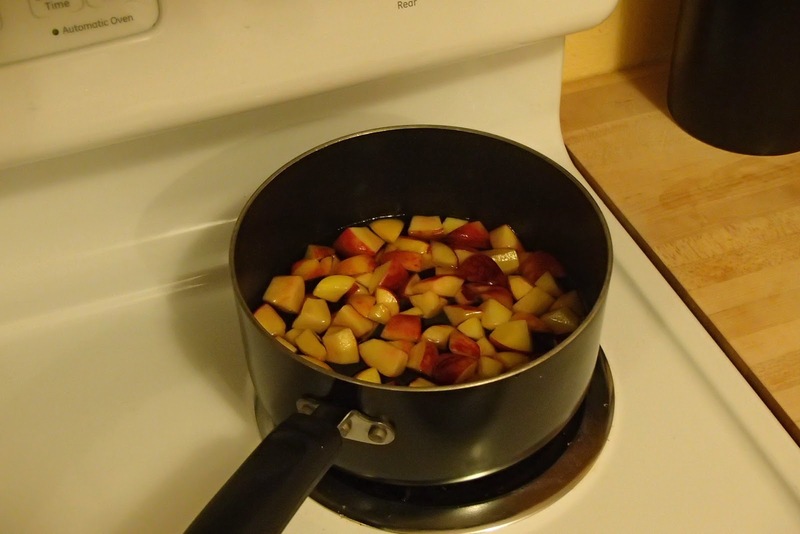 Heat one cup of water and one cup of sugar until fully combined, then turn down the heat and add three chopped peaches and a couple dime-sized pieces of lemon zest to your simple syrup. Let this mixture steep for 35 minutes, then strain into a vessel and cool. As for the cocktail itself, combine the ingredients in a shaker, shake over ice, then strain either up or on the rocks. I prefer most of my sipping drinks on the rocks so I can take my time with them, but that is by no means the only way to serve this drink. Then garnish with a lemon twist. I really am happy with this cocktail. The peach syrup is amazing. 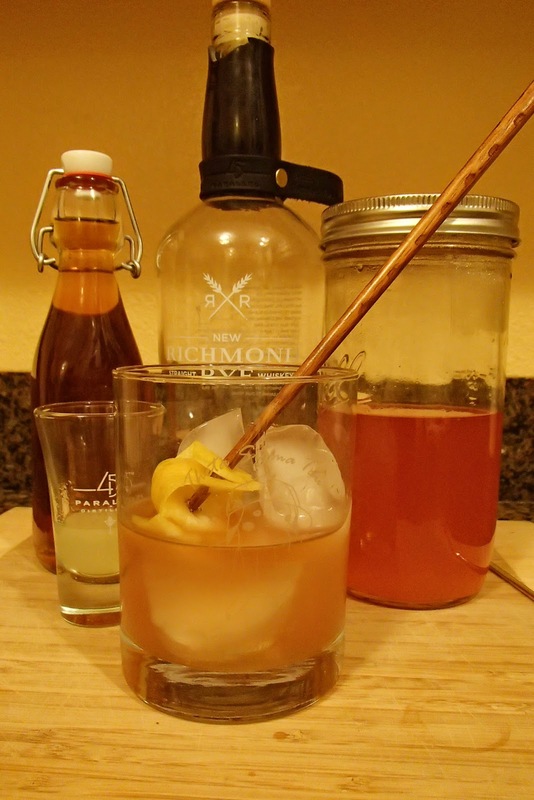 Sweet, but not cloying, the peach goes incredibly well with the spicy rye. The lemon juice adds the bright, tart kick that makes this drink so refreshing. 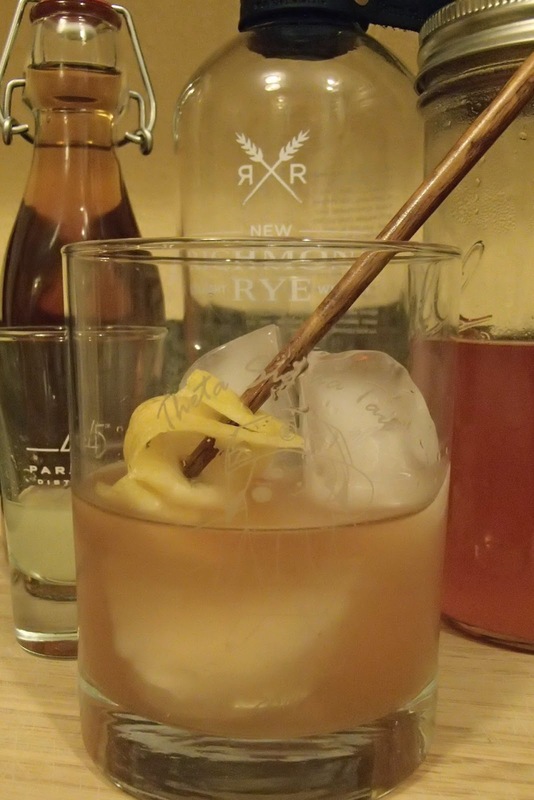 The rye remains the focus and is not overpowered. The tea tincture at the end leaves just a slight hint of bitterness, with smokey, herbal, and earthy notes playing in the background, blending the other flavors together beautifully. Let me know what you think of it if you make it, and especially if you make other tinctures out of tea. I’d love to hear from you! This picture’s pretty, though. I like this picture. Makes me thirsty. Well, folks, that’s the end of rye month. I’ve had a great time working with New Richmond Rye from 45th Parallel Distillery, and I hope I’ve been able to do such a great product justice while shedding a little more light on rye as a whole. Rye is thankfully enjoying a comeback, and I hope that trend continues for many years. For next month, I believe we’ll try rum. It’s a spirit I’m not particularly familiar with, and I’m looking forward to experimenting with it. If you have any suggestions on where I should start, let me know, and thanks for reading!